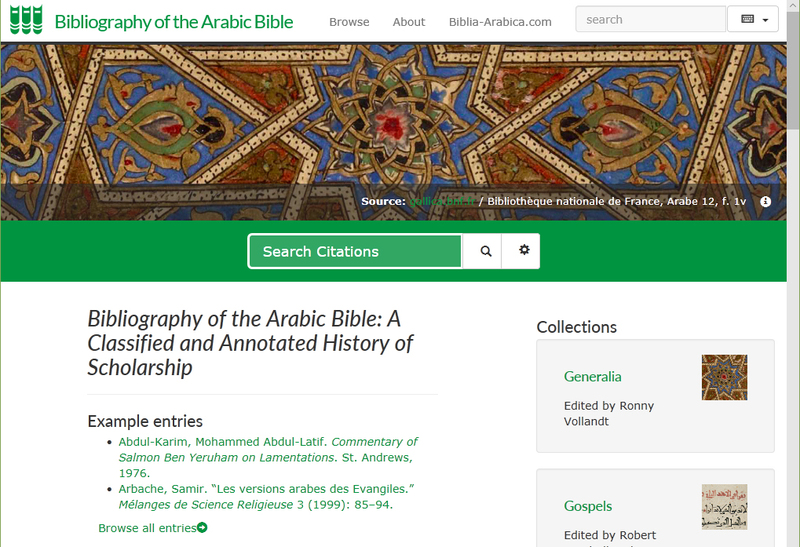 Fresh from the Biblia Arabica project comes a new bibliography of the Arabic Bible which is said to be a classified and annotated history of scholarship. The bibliography aims to include all Arabic Bible prints and all secondary literature on Arabic versions of the Bible, regardless of language. Currently we have entries in Arabic, English, Hebrew, French, German, Italian, Latin, and (coming soon) Russian. Translations made by three different communities––Jewish, Christian, and Samaritan––as well as citations by Muslim authors are all within scope. For more about this, see the Introduction. That said, what we are releasing today is the first 200 of about 1500 entries we have drafted. These published entries make up part or all of the following subject collections: Generalia (edited by Ronny Vollandt), Gospels (edited by Robert Turnbull and Vevian Zaki), Pauline Epistles (edited by Vevian Zaki), Qaraite Translations (edited by Ronny Vollandt and Michael Wechsler), and Quotations in Christian Arabic Writings (edited by Peter Tarras). Our plan is to upload new entries fortnightly, so stay tuned! Why Didn’t God Preserve the Biblical Autographs? Blog Dinner: Get Tickets Now!